To sod, or not to sod? In Arizona’s dry desert climate, this is a major question for homeowners who want to enjoy a lush green lawn, despite the blistery hot temperatures that can be incurred this time of year. Fortunately, there are actually many benefits of sod. With a bevy of reasons under its belt, sod can easily become your lawn’s best friend. The key is finding the right type of sod that works for your climate, as well as the unique elements specific to your own individual space. Asphalt, concrete, bare soil, and artificial turf have a tendency to emanate heat. Conversely, sod absorbs heat, creating cooling properties that can bring the temperature over the sod down 10 to 30 degrees cooler than other landscaping material. Those numbers are huge in a high desert region such as Arizona, where heat can easily overtake comfortable outside living spaces. With sod on your side, you’ll enjoy a built in natural balance against the sizzling sun. People say kitchens and bathrooms sell homes, but remember, buyers have to get past your front yard long before they walk through your front door. A well-landscaped home can increase the overall property value by 15 to 20 percent. Clean, soft grass is particularly appealing to perspective homeowners who have small children or pets who will likely romp around in the yard during playtime. 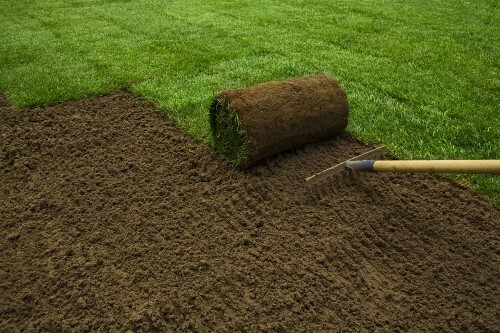 Sod is fully matured from the moment it’s installed, meaning it’s immediately ready to go to work, controlling erosion and rooting itself deep within the dirt beneath it. If you have steep hills on your property, sod can easily be installed on the slopes to perpetuate stabilization. If you have a dirt-covered lawn that’s prone to get muddy on the few occasions we get big rains in this part of the country, sod can eliminate the muck and mire and give you a lawn you’ll truly desire. By default, plants are humans’ best friends. They take the carbon dioxide we release into the air, process it, and send back fresh, clean oxygen for us all to breathe. Lawns are special carbon dioxide filters, given the sheer size they take up at any given time. Grass also absorbs harmful agents that find their way into the air we breathe, such as hydrogen fluoride and peroxyacetyl nitrates. Beyond this, the lovely blades on lawns also act as a natural dust and dirt filter, helping to keep an estimated 12 million tons of particles from floating around in the air by capturing it and making it part of its own ecosystem. Have you ever been inside a home that has no carpet or furniture? If so, you realize just how loud everyday sounds can be. A simple footstep echoes on the walls and makes a sound last much longer than it would if there was something around to absorb the sound. That’s what sod does for the exterior of your home. The impact of noise pollution—even by simple things like cars passing by—is greatly reduced when you have sod acting as a sound barrier. The thick layer of leaves and dirt are apt to absorb sound before it begins bouncing off area structures. Of course, no sod can combat the annoying noise of your neighbor’s unnecessary car alarm, but you’ll certainly hear a difference if you go from a dirt landscape to a lawn that’s covered in sound-absorbing sod. If you’re trying to figure out if sod would be a good solution for your lawn, we invite you to stop by our location at 11407 E. Germann Road in Chandler, Arizona. You can also learn about the sod varieties we offer here at Evergreen Turf, and if you already know what you want, go ahead and order online! This entry was posted on Friday, August 3rd, 2018 at 6:00 am	and is filed under Arizona Sod Landscaping. You can follow any responses to this entry through the RSS 2.0 feed. Both comments and pings are currently closed.